The Twitter account Minecraft Signs, created by @leonardr, is a goldmine of non-sequiturs and poetic delights found in Minecraft maps. 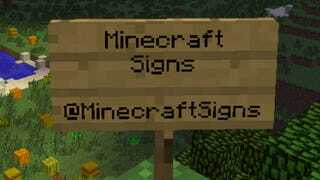 If you need some absurdist humor right about now, Minecraft Signs is here for you. Here are some recent bits of awesomeness.